At Our First Dance, we help couples fulfill their dreams of performing their first dance as husband and wife! Specializing in wedding dance lessons and choreography, we help you to create a special moment and memorable experience for you and your guests. Join our instructors Kian Yong and Zhi Xin as we introduce you to the enchanting and magical world of ballroom dancing as you prepare for the first dance of your lives! Kian Yong & Zhi Xin have been dancing competitively since 2008, and still actively participate in local and international Ballroom Dancing competitions. The husband and wife duo started dancing in their university days and have been dance partners ever since. 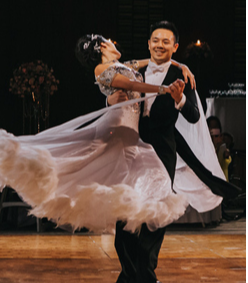 Passionate about ballroom dancing and how it has changed their lives forever, Kian Yong & Zhi Xin are always enthusiastic about sharing their love for ballroom dancing with new learners. Be inspired by their romance and love story as they guide you through the process of learning your first dance and as you enter the enchanting and magical world of ballroom dancing!